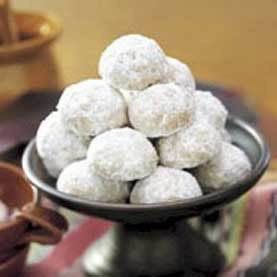 Day 2 of our 12 Days of Cookies includes a popular recipe called Mexican Wedding Cakes, Mexican Wedding Cookies, or Russian Teacakes. A wonderful holiday cookie recipe we make every year. Enjoy! Preheat oven to 400 degrees. Mix butter, 1/2 cup powdered sugar, and the vanilla extract. Stir in the flour, nuts, and salt until the dough holds together. Shape into small 1-inch balls. Place about 1 inch apart on an ungreased cookie sheet. Bake 10-12 minutes, or until set but not brown. Roll in powdered sugar while warm; cool. Roll in powdered sugar again. Makes 4 dozen cookies.This recipe, and 349 others, can be found in our cookbook “Rocky Mountain Lodge & Cabins Favorite Recipes”, which can be purchased at our Gift Shop. Click Here to order your copy! I made this recipe last year for the holidays! The cookies were out of this world delicious! Thank you for sharing it.